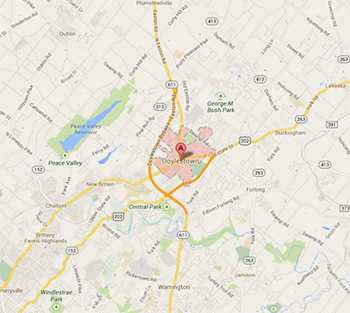 An experienced buyer's agent can help you locate, negotiate, and purchase your next home in Doylestown, Pennsylvania. Did you know that a buyer's agent does not cost anything to the buyer? The agent is paid when the property sells and the sales commisssion is split between the listing agent and buyer's agent. Don't do it alone, an experienced real estate agent (realtor) can really make a difference. I have properties ready to show in this area. Doylestown, Pennsylvania is one of those unique bedroom communities outside Philadelphia that pretty much has everything you need; if not, you don't have far to drive to get it. Trenton, New Jersey is across the river and Philadelphia less than an hour south. But if you're in the market for a condo or single family home, the prices are much better in Doylestown than other neighboring cities. Considering that the population of Doylestown, PA is less than 27,000 it appears the city will have a nice slice of blue skies and green lights when it comes to real estate action. From June to the middle of August, 2013 the median sales price for homes in Doylestown, based on 168 home sales was $390,060. At this same time last year median home sales prices were down by nearly four percent or $14,940. Then as September, 2013 came to a close the average "listing" price for homes in Doylestown, PA was $634,813 which presented an increase of almost one percent compared to the prior week. The average price per square foot for the Doylestown area was $180 per, an increase of four percent. That said, the overall consensus shows that at the end of summer (8/31/2103) the home value index was $370,000 which was a one-year increase of a plus two percent. The median listing price for homes was $429,900, and the median sales price was $373,300. There were a total of 48 homes sold in the month of August with another 164 still available for sale in the area. New homebuyer wannabes interested in dealing with banks and other mortgage lenders will find 95 homes in the pre-foreclosure, auction, or bank-owned stages of the foreclosure process which is not many when you consider the total Doylestown area population. The city of Doylestown, PA offers public and Catholic schools, K-12, K-6, and K-8 and a crime rate less that 1.5 percent. Also if you're on a tight family budget, there aren't many places where you can buy a 2 bed - 1 bath starter home for less than $20,000 or a 2 bed - 1 and 1 1/2 bath home for less than $195,000. In Doylestown, PA you can. No matter the type of home you are looking for in Doylestown - colonials, townhomes, condos, ranchers, victorians, contemporary homes, farmhouses, split-levels, REOs / foreclosures, etc. - we have it listed. Click here for the latest MLS listings in Doylestown!